Smilax aspera Prickly ivy Αρκουδόβατοσ ￼ Smilacaceae - smilax Family Monocot. Smilacaceae - smilax Family Monocot. This climber can be found scrambling through bushes, climbing high into pine trees and entwining fences throughout the island. The long stems are square in cross section with sharp thorns and have tendrils arising from the leaf axils.. The leaves are elongated heart shaped, reddish brown and shiny when young becoming dull dark green with light polygonal patches as they age. The plants are unisexed or dioecious, that is, the male and female flowers are found on separate plants. The flowers,which are arranged in clusters, have flower parts in 3's and superior ovary, the characteristics of the family. Both male and female flowers often have a rosy pink blush. 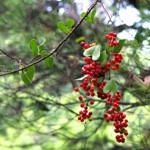 The female flowers are followed by red berries which are loved by birds. The young shoots of Smilax aspera are edible and can be eaten as a substitute for asparagus and make a tasty addition to an omelette.